Near Normalcy: My child is seriously twisted. I don't know where she gets it. Also she thinks I'm more talented than I am. My child is seriously twisted. I don't know where she gets it. Also she thinks I'm more talented than I am. 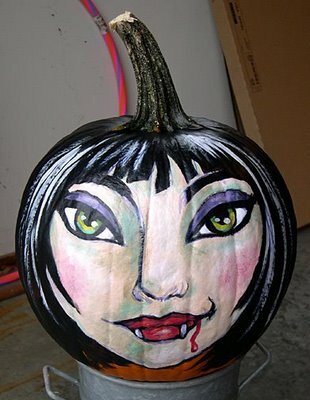 The Princess somehow came across a photo online of a painted pumpkin (I blame her father. Because...well, he's the one who showed it to her). Normally he's in charge of pumpkins in this household, as Official Carver of Gourds and Melons. But painting? Apparently painting is my thing. I'm not sure how painting became my thing, because...I'm not a painter. But the Official Carver of Gourds and Melons has informed me that, as his title suggests, he carves; he does not paint. So by default...painting is my thing. So she wants a painted pumpkin, and I'm supposed to help. Does she want a cute little kid kind of cartoony pumpkin? A pumpkin with a goofy smile and triangle eyes, a pumpkin her less-than-uber-talented mother might have a shot at accurately recreating? A pumpkin that...won't give anybody nightmares? No. No she does not. but, um...there is no way I'm that talented. That thing is 12 kinds of awesome. She was so enamored of this pumpkin that she made her daddy print this photo out and it is currently taped to her bedroom door. So every night when I go to bed, I tiptoe down the silent hallway to check on my little sleeping Princess...and find myself faced with this haunting visage, floating somewhere around chest-level in the dark, observing me with her wide, knowing eyes and her bloody smirk. It's...well, it's unnerving. And this from the woman who purchased a Zombie Baby eating its own foot and lovingly named it Gnarles. But hey. Gnarles lives outside, ok? And I'm an adult. I'm allowed to be demented. My baby girl? Well, it's inevitable that she, too, will be demented. I just thought it would take a few more years to get there. I love it! You are going to have to do one and show us ... can't wait! I hate to even attempt it, Adrienne. It'll be like an insult to your beautiful work. Haha. But, hey. I somehow believe I'm going to be forced to give it a shot. It'll be comedic gold, I'm sure. It looks like a bratz doll. A) Gourds and Melons are one responsibility no matter what the decorating option ... except bedazzling. No man needs to play with glue guns & rhinestones. A) I'm afraid our Official Carver of Gourds and Melons disagrees with your assessment of his duties. Basically, if there are not knives involved, he is out. I really should have put all this in writing years ago. I'm afraid if I try to force the issue now, he will initiate union involvement. And nobody wants that. C) Also? Bedazzling! Next year our pumpkins shall be bedazzled. Oh please, oh please, oh please bedazzle your pumpkin! PLEASE! HA! Love it! See? Now I don't need to bedazzle my pumpkin. It's been done. Oh heavens - I'm so glad to hear YOU didn't paint that pumpkin. But because it's too damn good. she has a mind of her own and knows what she likes. So good luck getting those fangs right, mama! She most definitely does have a mind of her own! :) I guess I'm going to dive in with my paints this weekend. I'll post the sure-to-be-hilarious results ASAP. So. I'm an artist now. Halloween Madness. No seriously. It is MADNESS. In which I inspire greatness. Did you know? I'm a writer.